Update, 5/22/13: Not much has changed with the spider. It’s had a valve job to pass smog, and a new rare earth starter (which sounds funny, incidentally – nothing like the old one). However, being my longest-owned car, I did call on it for an important duty in 2012: it got my wife and me to the hospital to give birth to our daughter! Might as well start from the beginning, since that’s a very good place to start. As mentioned in one of my posts, this car was my gateway drug to old car ownership. As a high school kid in 1991, I’d been looking around at BMW 2002s, a 1600, and I think maybe a Triumph or two. However, they were always either a little pricey or needed too much work. 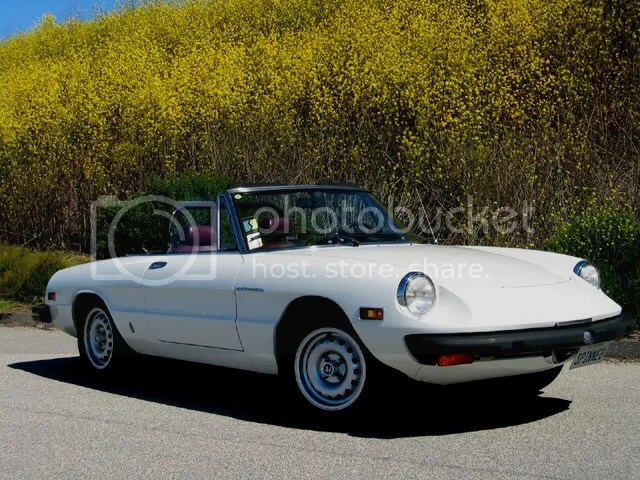 Then, while considering my alternatives, it hit me – for the same price as a 2002, I could have a spider with the same power (and cool mechanical fuel injection) as a 2002tii, plus the top went down! I found my prize in the $2500-and-under section in the San Jose Mercury News. The seller – Gary Larson, but not the one who did Far Side – was selling it for his son, who’d had it after wrecking his first spider while in school in Berkeley. I checked out the car, which was not too leaky or rusty, and reasonably clean, did a test-drive on which I did an unintentional brake test by almost running someone over, and had it checked by a mechanic. $1300 later and it was mine. The first thing I did when I got it home was remove the patchwork seat covers, which looked like they’d been put together from hides stolen out of the back of a veterinarian’s office. I had the worn tie rod and rear window replaced, and drove it to school a few times. Then, one happy day in September I was driving my new toy to pick my sister up when a guy in a white Civic Si tried to be in the same space as I…. ended in me running over a curb, with the pan guard 6 feet behind the car and oil all over the place. Dents poked up where the engine was pushed up by the curb. To shorten the story, the other driver stopped, confessed, and the insurance company paid me enough to get the transmission and engine rebuilt. I also took the chance to get new upholstery, and paint from the local Miracle Paint. 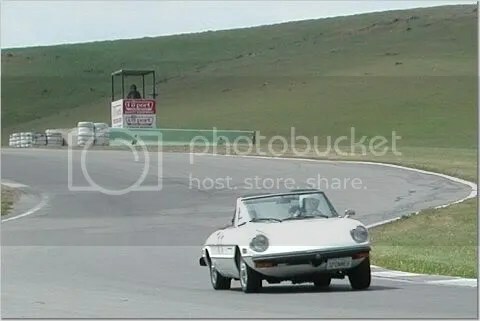 Here’s my car in its first iteration at Thunderhill, substantially after all the work was done. The $700 paint job held up remarkably well for 14 years, succumbing in its last couple of years to some bubbling from poor prep on the right rear fender. Here it is in its current iteration. In 2005 I had Andy Schank do my paint after his friend Larry fixed all the small rusty bits, and went crazy with the Re-Originals, International Auto Parts, and Centerline catalogs. I also picked up some GTA-repro wheels from Alfaholics. It’s amazing how much new wheels do for a car, and I always hated the turbinas for their looks and hard-to-clean-ness. 2001: Rebuilt engine including 10:1 pistons, 1750 cams, valve job from Norman, ’74 exhaust drilled for air rail. 2005: Rebuilt suspension, front and rear. Everything but shocks and springs. 2006: Transmission rebuilt from used parts from APE. My fault for being tired and frustrated, which led to a bad decision on how to drive with a failed slave cylinder. There’s too much more to count, but at this point the car’s quite reliable. I have one JUST like it! In Alameda! yours is nicer, however. well yes i did! nice guy. had mine 13 months now and not a problem. im a convert from volkswagens. im totally hooked.will be redoing my seats soon. thats great! thx for the info. good to have a german car as a daily driver i suppose…i have a 99 bmw. il try and hit some events. thx again for the info…..